The Children’s Garden is open year-round! Enhance your visit by experiencing Lewis Ginter through these self-guided activities. April 4 and 5 from 10 a.m. – 1 p.m. Central Virginia Waste Management Authority will be in the Children’s Garden with information on recycling and a craft. The Children’s Garden is designed so youngsters can experience the great outdoors by observing wildlife; digging in the dirt; climbing a one-hundred-year-old mulberry tree, or simply doing nothing at all. Learn more! Come Play with Us! 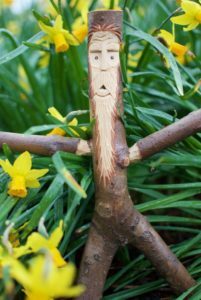 Frolic in the Garden through six playful stations and find Stickman and his friends in this special edition of Stickman Kid Quest, a themed scavenger hunt that asks families to search for six clues. To get started, just ask for a Kid Quest and a map at the admissions desk in the Robins Visitors Center. Follow the directions to all six clues and record your answers on the brochure. If you find all six clues, you can get a prize by showing your completed Kid Quest to an Admissions Staff member. Borrow a walking stick and take a trek along the Tree Trail. Nature Meditation: Adults and children alike can enjoy a special place in nature which will soothe, comfort and relax you. Planning your next visit? There’s always something wonderful happening in the Children’s Garden! Drop in and see us during these spring, summer, and fall programs.